Stuff Points: Earn 750 points when you buy this stuff. Priced right for the mid-size growing operation, this light can support up to 9 plants. It consumes very little electricity when compared to traditional bulbs, and it offers a spectrum of light that can't be matched by other LED models. The bright white glow will give you more usable light than the competition, and it's so similar to sunlight that it will support your fruits and vegetables through growth and vegetation. You won't need a separate light to flower, and you won't need any fans or ventilation either. 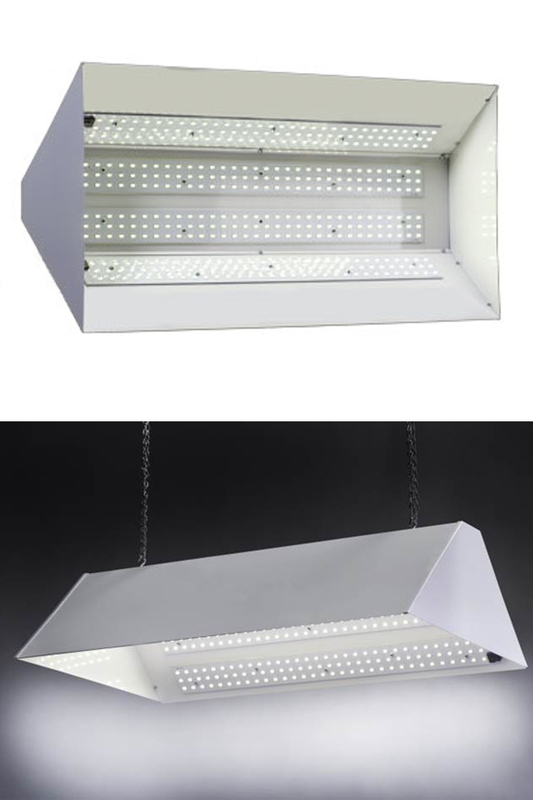 The array of 256 light emitting diodes will remain cool to the touch while operational, and they will provide the perfect conditions for growing large flowers and prize winning vegetables. Unlike other systems that require separate power supplies, or augmentation by fancy colored lights, this all-in-one solution will be the only thing you need to go from seed to harvest, and it will do so in as little as 8 weeks. Superior functionality is guaranteed thanks to advanced engineering, top quality components, and manufacturing that takes place in the US. Thanks to long lasting bulbs that stay bright up to ten times longer than HPS or MH versions, overall operating costs are much lower in comparison. Don't waste money by guessing on the performance of other brands. When compared for yield, this commercial quality, LED grow light is tough to beat. This is the mid-range system in this line, but we also carry one that can handle more, and one that can handle less. With the ability to support up to nine plants at once, the version featured here is a good choice for almost anyone. For the seasoned grower, or the novice determined to grow as much as possible, the MAX 600 may be a better choice. It has more LED's, and can increase your capacity to 12 full size plants. If you're just starting out, or if you need a smaller capacity unit for flowering or starting seedlings, check out the MAX 200. It's only rated for 4 plants, but it also has a price tag to match. No matter which version you choose, you will guarantee results thanks to the commercial quality construction, and the advanced, full spectrum diodes. Improved Performance. With a bright white glow that is more similar to what the sun produces, you get a light that works better. Not only will it cause faster growth and healthier plants, it will also allow you to flower without switching out ballasts, or moving your plants. Professional Quality. From the durable materials to the precision engineered diodes, this unit is made for professionals, but priced for the home user. With a commercial quality set up at home, you'll be able to produce like a pro, and the quality will be comparable. As an added bonus, the improved components will be more durable and longer lasting. Long Life. Replacing traditional bulbs can be expensive, so the overall cost can begin to add up. The LED bulbs on this unit will last years longer in comparison, and they are almost impossible to accidentally break, unlike other options. Use all day, every day, and never worry about dull or failing lights. Full Spectrum. Bright lights are great, but usable light is key. When tested for performance, the MAX proved that it produces more usable light that most other options. An added benefit of the cool surface is that you can clean off any dust whenever needed to keep transmission at peak levels. Silent Operation. Did you here that? No you didn't. With no noisy fans inside, and no external ventilation necessary, this grow light is much quieter when compared to others. Cool. Proper design keeps the diodes and everything else cool without any additional fans. With no heat created, you won't have to worry about sucking it out of the area, or plants wilting. Other manufacturers will only test at the very center when rating their lights. This results in a high reading, but if you were to travel outward, the PAR rating would decrease quickly and drastically. The MAX is different. The impressive rating on these lights takes into account every square inch that the light shines on in order to give a realistic rating. If you only plan on growing one plant, then it's easy to trust and rely upon the ratings you see elsewhere. For anyone that needs to grow to the capacity of the light, the rating becomes much more important. The MAX line was designed with high yields in mind, and that's why it delivers more usable light to all areas under the glow. This allows for more vigorous growth overall, but also even growth throughout all plants, without any rotation required. Stop wasting money buying from another grower. Start your own, in-home growing operation to control quality and save money at the same time. There's nothing better than fresh local produce, and what could be more local than your attic or basement. Other systems require confusing infrastructure, or costly add-on's, but this simple and effective grow light can be used by anyone to grow flowers, fruits or vegetables in the comfort of your own home. Just hang it up and plug it in to complete the set up process, and then start growing up to nine plants underneath. It's the next best thing to growing outside, and it will allow you to turn any space indoor space into a mini farm with crops of your choosing. From start to finish, it only takes about eight weeks, and you can even use it to start plants that you will finish in your garden outside. Easily enjoy fresh fruits and vegetables, all year long by using the MAX 400. # LED 256 High Power Diodes in four strips. A high yield indoor grow light that runs on very little electricity. Bright white bulbs provide full spectrum light to improve plant health, and make everything grow faster. Save money and improve your harvest at the same time. Order Yours Today! The Easy and Strain-Free Way to Open Pill Bottles. Wrap presents fast and easy with this set of useful tools. A High Quality Flashlight That's Also A Bottle Opener. Clip It Anywhere! A Miniature Fan And Personal Cooling Device. No Batteries Required! Never Lose Your Lighter Again! Doubles As A Bottle Opener. A Key Chain Tool For Cigar Smokers. Doubles As A Bottle Opener. 15-Pack. A full replacement set of pads for your green humidifier.